Cult classic The Wicker Man is reissued for the 45th anniversary of the film release (6th December 1973) with new artwork and packaging. Against all odds, one of the most talked about soundtracks in movie history rose to the surface in 2002. 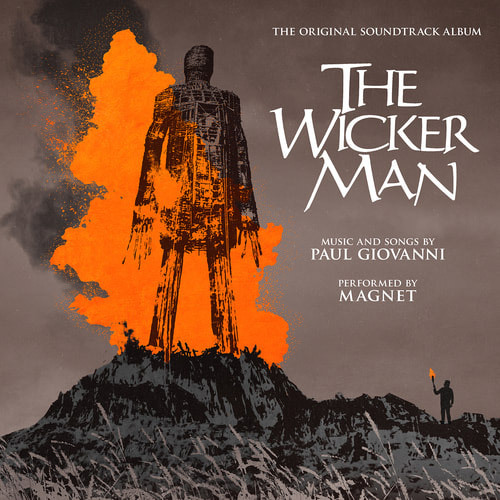 Believed for years to be lost, destroyed or even buried deep beneath a motorway, this disc contains Paul Giovanni’s original music to The Wicker Man. These historic recordings had, up until then, only been heard by a select few. Based on the themes of fertile pre-Christian practices of pagan Britain, The Wicker Man did not follow the predictable formula of 1960’s British horror movies. The equally non-formulaic music score was provided by talented songwriter Paul Giovanni, and his assistant Gary Carpenter. With only six weeks allotted to write, research and record the soundtrack, Paul draws on the rich traditions of Celtic music to present a brilliant collection of eclectic folk songs underpinned with aeons-old verse. The first 8 tracks are the stereo masters which would have been the soundtrack to The Wicker Man that Paul Giovanni originally intended for album release, which ultimately never happened because of the film's troubled history. The following three tracks were recorded for the film and used for playback purposes on set but only exist in mono versions. These have been digitally restored and enhanced for CD release. The balance of the tracks have been compiled from various sources (with occasional sound effects) and present elements of the background score to the film to give a more complete representation of this unique score.